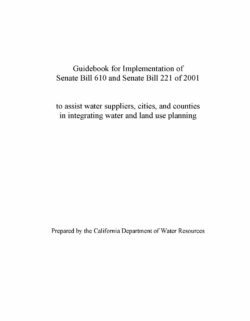 Senate Bills 610 (Chapter 643, Statutes of 2001) and Senate Bill 221 (Chapter 642, Statutes of 2001) amended state law, effective January 1, 2002, to improve the link between information on water supply availability and certain land use decisions made by cities and counties. SB 610 and SB 221 are companion measures which seek to promote more collaborative planning between local water suppliers and cities and counties. Both statutes require detailed information regarding water availability to be provided to the city and county decision-makers prior to approval of specified large development projects. Both statutes also require this detailed information be included in the administrative record that serves as the evidentiary basis for an approval action by the city or county on such projects. Both measures recognize local control and decision making regarding the availability of water for projects and the approval of projects. Under SB 610, water assessments must be furnished to local governments for inclusion in any environmental documentation for certain projects (as defined in Water Code 10912 [a]) subject to the California Environmental Quality Act. Under SB 221, approval by a city or county of certain residential subdivisions requires an affirmative written verification of sufficient water supply. If coordinated and comprehensive water supply planning is underway at the time that the SB 610-water assessment is prepared, compliance with SB 221 will be greatly facilitated. SB 221 is intended as a ‘fail safe’ mechanism to ensure that collaboration on finding the needed water supplies to serve a new large subdivision occurs when it should – before construction begins. Not every project that is subject to the requirements of SB 610 would also require the mandatory water verification of SB 221 (e.g. if there is no subdivision map approval). Conversely, not every project that is subject to the requirements of SB 221 would also require the environmental document to contain an SB 610 water supply assessment. Projects approved before January 1, 2002 were not subject to the requirements of SB 610 or SB 221; however, some projects may have been subject to the requirement to prepare a water supply assessment as set forth in Senate Bill 901 of 1995 (Chapter 881, Statues of 1995). A foundational document for compliance with both SB 610 and SB 221 is the Urban Water Management Plan (UWMP). Both of these statutes repeatedly identify the UWMP as a planning document that, if properly prepared, can be used by a water supplier to meet the standards set forth in both statutes. Thorough and complete UWMPs will allow water suppliers to use UWMPs as a foundation to fulfill the specific requirements of these two statutes. Cities, counties, water districts, property owners, and developers will all be able to utilize this document when planning for and proposing new projects. This report is intended to inform the public about key factors important to the operation of the State Water Project (SWP) and an estimate of its current delivery capability. For many SWP water contractors, water provided by the SWP is a major component of the water supplies available to them. SWP contractors include cities, counties, urban water agencies, and agricultural irrigation districts. These local utilities and other public and private entities provide the water that Californians use at home and work every day and that helps to nourish the state’s bountiful crops. Thus, the availability of water from the SWP is an important component to the water supply planning of its recipients and ultimately affects the amount of water that local residents and communities can use. The Department of Water Resources is issuing this report to assist the contractors of the State Water Project in the assessment of the adequacy of the SWP component of their overall water supplies. SWP delivery reliability is of direct interest to them and those they serve because it is an important element of their overall water supply. Local supply reliability is of key importance to local planners and government officials who have the responsibility to plan for future growth while assuring an adequate and affordable water supply is available for the existing population and businesses. This function is usually conducted in the course of preparing a water management plan such as the Urban Water Management Plans required by Water Code Section 10610. Information in this report may be used by local agencies in preparing or amending their water management plans and identifying the new facilities or programs that may be necessary to meet future water needs. Local agencies will also find this report useful in conducting analyses mandated by legislation authored by Senator Sheila Kuehl (SB 221) and Senator Jim Costa (SB 610). These laws require water retailers to demonstrate the sufficiency of their water supplies for certain proposed subdivisions and development projects subject to the California Environmental Quality Act. 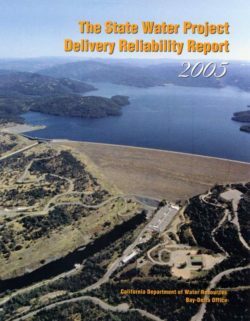 The State Water Project Delivery Reliability Report 2005 presents DWR’s current information regarding the annual water delivery reliability of the State Water Project (SWP) for existing and future levels of development in the water source areas, assuming historical patterns of precipitation. 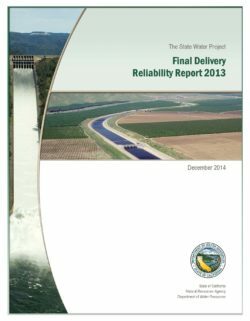 This report first looks at the general subject of water delivery reliability and then discusses how DWR determines delivery reliability for the SWP. A discussion of the analysis tool (the CalSim II computer simulation model), the analyses, and peer review regarding the accuracy of CalSim II and its suitability for use in this report is included. Finally, estimates of SWP delivery reliability today and in the future are provided along with examples of how to incorporate this information into local water management plans. This report responds to a requirement in the settlement agreement with the Planning and Conservation League to provide an assessment of the existing delivery capability of the SWP over a range of hydrologic conditions. The range of conditions is to include the historic extended dry cycle and the long-term average. In addition, the biennial report is to include the total amount of project water delivered and the amount of project water delivered to each contractor for each of the 10 years immediately preceding the report. The State Water Project (SWP) is primarily a water storage and delivery system intended to help close the gap in California between when and where precipitation primarily falls and when and where most water demands occur. Water from the SWP is a critical component of water supply for the 29 state water contractors, who may also receive water from other sources. While each of the water supply contracts defines the maximum amount of water to be delivered annually, the amount of water actually delivered may be less due to such factors as variable precipitation and runoff, physical and institutional limits on storage and conveyance, and contractors’ variable water demands. For communities receiving SWP water, the reliability of SWP water deliveries is a key factor for local planners and government officials estimating their own water supply reliability. 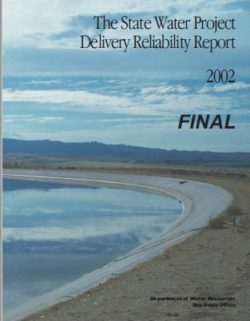 The 2009 State Water Project Delivery Reliability Report (2009 Report) updates the information contained in the 2007 Report by estimating the amounts of water deliveries for Current Conditions and conditions twenty years in the future. These estimates incorporate restrictions on SWP and Central Valley Project (CVP) operations in accordance with the biological opinions of the U.S. Fish and Wildlife Service (USFWS) and National Marine Fisheries Service (NMFS) issued on Dec. 15, 2008 and June 4, 2009, respectively. The estimates for Future Conditions also incorporate potential changes in hydrology due to climate change projections recommended by the Climate Action Team and sea level rise. 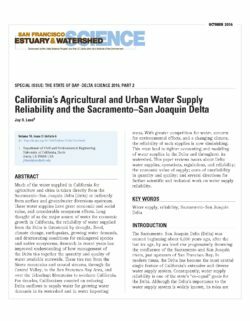 This report briefly describes the SWP and the Sacramento-San Joaquin Delta (Delta), the hub of water deliveries in California. 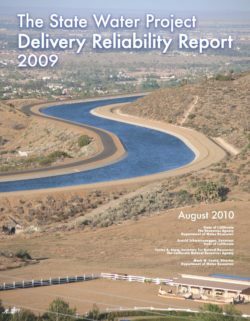 It discusses the general topic of water delivery reliability and how Department of Water Resources (DWR) calculates delivery reliability for the SWP. It then summarizes key planning activities that may affect future SWP delivery reliability. Three areas of significant uncertainty for SWP delivery reliability are discussed. They are climate change and sea level rise, the vulnerability of Delta levees to failure, and operation restrictions imposed by the USFWS and NMFS in response to decreasing populations of endangered fish species. Next, the general approach taken to simulate SWP operations using CALSIM II is discussed. This report presents the results of CALSIM II studies and compares them to previous estimates. Finally, this report provides guidance on how to apply the delivery estimates to water management plans. assumptions and results and recent SWP deliveries. This report does not include analyses of how specific water agencies should integrate SWP water supply into their water supply equation. This topic requires extensive information about local facilities, local water resources, and local water use, which is beyond the scope of this report. Moreover, such an analysis would require deci sions about water supply and use that tradition ally have been made locally. DWR believes that local officials should continue to fill this role. The water delivery reliability of the State Water Project (SWP) is at a crossroads. Future water deliveries to millions of Californians throughout the state will be impacted by many factors. Two of the most significant changes facing the system are Delta pumping restrictions and climate change. This report provides a glimpse of our current path if no action is taken to address these and other factors affecting water delivery reliability. The report also identifies many other factors that could be changed to positively affect our water future. 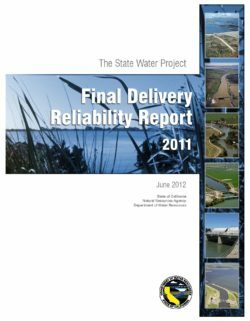 Estimating the delivery reliability of the SWP depends on many issues, including possible future regulatory standards in the Delta, population growth, water conservation and recycling efforts, and water transfers. The impact of climate change on hydrology, consumptive use of water, fisheries and sea level rise must also be considered. This report evaluates the impacts of potential changes in hydrology of climate change. These other factors also need to be considered in the future. The stability of Delta levees, and therefore, SWP water deliveries, are threatened by earthquakes, land subsidence and floods. On the positive side, there are significant and promising processes underway that could take us to a much more reliable and sustainable Delta water conveyance system for the SWP. In this report, a possible future for these factors is presented. However, to the extent that these factors can be and are changed by actions over the next few years, this estimate of water delivery reliability will also change. The State Water Project Delivery Reliability Report 2011 (2011 Report) is the latest update to a biannual report that describes the existing and future conditions for State Water Project (SWP) water supply that are expected if no significant improvements are made to convey water past the Sacramento–San Joaquin Delta (Delta) or to store the more variable runoff that is expected with climate change. This report is presented in a different format than previous versions. The four previous reports were written for a dual audience—both the general public and those interested in a greater level of technical detail, such as the SWP contractors. By contrast, this report is written primarily with the public in mind. As a result, it not only provides updated information about the SWP’s water delivery reliability, but is also designed to educate Californians about the SWP and its operations. This report presents a concise description of the historical events leading to the construction of the SWP and describes the SWP’s facilities and operations. It then defines and explains the concept of water delivery reliability and the types of SWP water available to contractors, and describes various factors that affect the reliability of water deliveries. Because of the public interest in water project pumping from the Delta and the dependence of SWP water supply on Delta pumping, a new chapter has been added that focuses specifically on SWP pumping (exports) at the Harvey O. Banks Pumping Plant in the Delta. 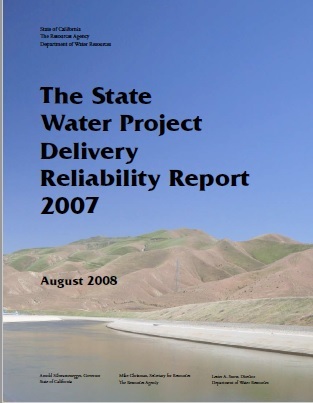 The 2011 Report shows that the SWP continues to be subject to reductions in deliveries similar to those contained in the State Water Project Delivery Reliability Report 2009 (2009 Report), caused by the operational restrictions of biological opinions (BOs) issued in December 2008 and June 2009 by the U.S. Fish and Wildlife Service (USFWS) and National Marine Fisheries Service (NMFS) to govern SWP and Central Valley Project operations. Federal court decisions have remanded the BOs to USFWS and NMFS for further review and analysis. We expect that the current BOs will be replaced sometime in the future. The operational rules defined in the 2008 and 2009 BOs, however, continue to be legally required and are the rules used for the analyses supporting the 2011 Report. The following “Summary” includes key findings of the analyses in the 2011 Report. A technical addendum is also available which provides detail on the assumptions of the analyses and the results for the 2011 Report. The results of the studies, as presented in this report and the technical addendum, are designed to assist water planners and managers in updating their water management and infrastructure development plans. These results emphasize the need for local agencies to develop a resilient and robust water supply, and a distribution and management system to maximize the efficient use of our variable supply. They also illustrate the urgent need to improve the method of conveying water past the Delta in a more sustainable manner that meets the dual goals of increasing water delivery reliability and improving conditions for endangered and threatened fish species. 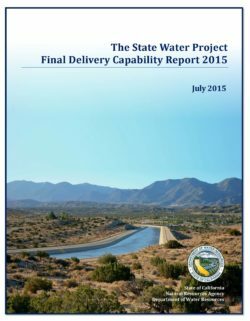 This State Water Project Delivery Reliability Report 2013 updates the estimated water delivery capability of the State Water Project (SWP) for current conditions and two decades from now. The estimates include the best-known future effects of climate change and the anticipated changes in Sacramento River basin land uses. Climate change will alter the timing and magnitude of inflows to upstream storage facilities including Shasta, Folsom, and Oroville reservoirs. In addition, rising sea levels will pose operational challenges to maintaining suitable salinity levels in San Francisco Bay and the Sacramento–San Joaquin Delta (Delta). Other factors in our analysis of SWP reliability have been assumed to not change over time. They are too uncertain to incorporate into the analysis. For example, regulatory restrictions issued by the U.S. Fish and Wildlife Service and the National Marine Fisheries Service in their biological opinions are assumed to remain unchanged. The opinions dictate the timing and amounts of the SWP’s Delta exports. These restrictions are undergoing further review and analysis under a federal court order. Also, the Delta water quality and flow requirements contained in the State Water Resources Control Board’s water quality control plan for the Delta are assumed to remain unchanged. However, the board is revising its water quality control plan. Revisions to the plan and their subsequent inclusion into the California Department of Water Resources’ (DWR’s) water rights for the SWP could have a significant effect on SWP deliveries. The estimates in this report can be used by water districts as part of the analyses for their water management plans, which are required by State legislation to be updated in 2015. The report includes estimates for a range of hydrologic conditions that should be considered in water management plans. These estimates do not incorporate the risk of a disruption in SWP deliveries caused by catastrophic failure of Delta levees. Delta levee failure as a result of floods, earthquakes, erosion, or rising sea levels could interrupt water deliveries from the Delta for weeks, months, or even years, depending on the nature and the scope of the failure. Water management plans should describe the response to this potential scenario. This assessment of current and future SWP reliability is one of several efforts by DWR to help plan for reliable future water supplies in California.